The Nuclear Regulatory Commission is in the early stages of an environmental review for Waste Control Specialists’ application to expand its low-level nuclear waste facility in Andrews to include a portion of the nation’s high-level nuclear waste. 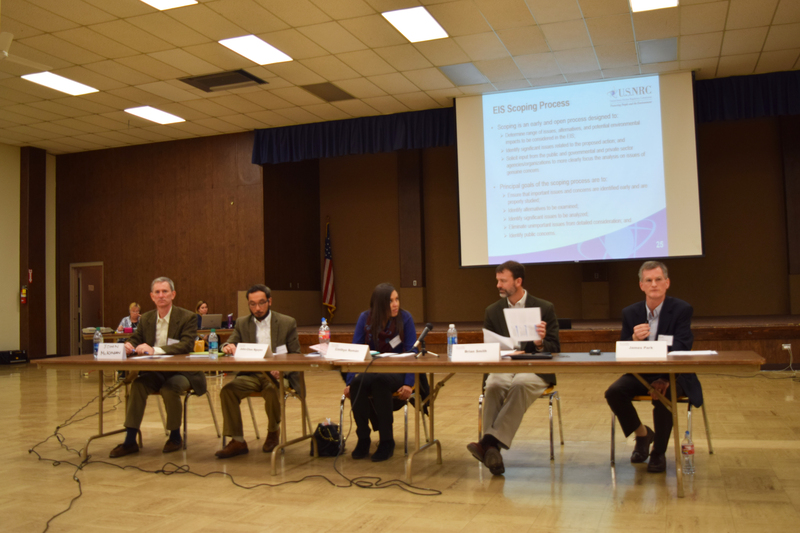 On Wednesday night, the commission held a public meeting in Andrews, Texas to hear comments about a plan to expand the existing site. Over two hundred people gathered at the James Roberts Center, and voiced their opinions for nearly three hours. Those opposed to the idea of the West Texas town becoming an interim high level nuclear waste site voiced environmental concerns and lack of public understanding regarding the subject. Those in favor cited the economic boosts of a potential site expansion and emphasized that the company would take the appropriate precautions to protect public safety. The Nuclear Regulatory Commission will be accepting comments from the public until March 13th, 2017. *In an early version of this story, we reported that the potential expanded site would include all of the nation’s high-level nuclear waste. It would only be a portion. We are sorry for the mistake and it has been corrected. This entry was posted in KRTS News and tagged Andrews, Environment, Nuclear Regulatory Commission, Nuclear Waste, Waste Control Specialists. Bookmark the permalink.